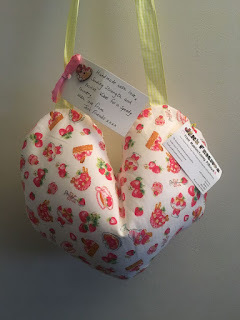 Those of you that have read my What To Pack In Your Mastectomy Hospital Bag post will know that I classed my mastectomy heart shaped pillow as one of the most important things on the list. Post op I was really sore and used the pillow under my arm whilst I was lying down. When I was on the move I tied the ribbon diagonally, across my body, sitting under my arm to take the pressure off. The great thing about my pillow was it was FREE! 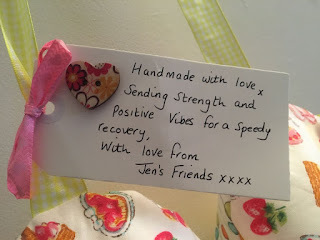 Each pillow is hand mad eand comes with a handwritten note- they are just beautiful. If you are having surgery and think you could use one of these fabulous heart pillows (or two if you are having a bilateral mastectomy) then head over to Jen's Friends Facebook Page and drop them a message stating how many pillows you'd like along with your address. The pillows are free but all they ask is that you contribute to the postage. You'll need to donate a minimum of £3.50 towards postage and packaging if in you're in UK or $7 if you are in the USA. Payments should be made through Paypal. I can highly recommend these pillows and I think that Jen and her pillow army are doing a fantastic job!